This traditional and beautiful building is found in one of the most photogenic areas in Madrid. 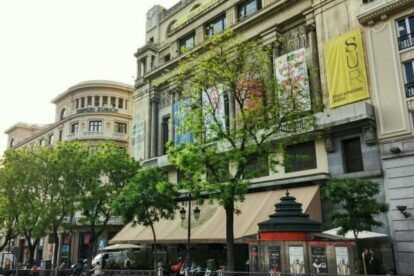 Very close to Plaza Cibeles, Círculo de Bellas Artes is a center for modern art, literature and leisure that you cannot miss. Its members used to be a close circle of artists, think about a young painter named Pablo Picasso taking art lessons here; but it has opened its doors to the general public over the years. Art exhibits, non-commercial movies and documentaries, workshops, literature clubs, concerts, book presentations, plays and many more activities are on its agenda every day of the year. If you are not a member, you can still come to some of the events, so go to their web-site for schedules and fares. Some workshops and the access to the library are only for members, but most of the activities are not and the prices are more than friendly. Círculo de Bellas Artes is where Azotea terrace is located (check the La Azotea article), so if nothing else is possible, come up to the terrace and enjoy the view. Or go to their restaurant “La Pecera” on the main floor. It is also the place where The Economist hosted the event “Future of Travel”, in which our own Bart Van Poll gave a presentation about Spotted By Locals. I was lucky enough to listen to all the interesting topics discussed that day, and the iconic Círculo de Bellas Artes was just the perfect place for such an event.